Lucy is a light English summer ale, spiced with ginger, lime, and coriander. It will remind you of warm summer nights on the beach. To set the stage, I’m vacationing at my sister-in-law’s house in Front Royal VA. I have been doing some late afternoon early evening reviews from the deck after a long hot day playing with the kids in the poor. I ran out of the beers that I brought with me so I went to the local store today and picked up something that I can’t get in PA. So let’s see what Lucy holds in store for us. The beer pours a clear golden yellow with a diminishing bright white head. 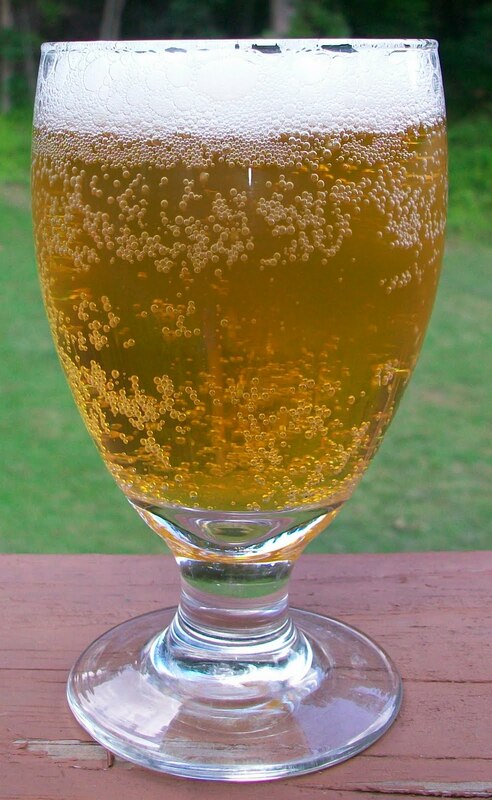 This beer is highly carbonated with a tremendous amount of tiny bubbles rising up from the bottom of the glass. The nose is very sweet with predominately citrus aromas. This actually smells more like a Shandy. Well, it tastes like a lime Shandy also. There is also a little spice on the final aftertaste. The taste starts out with a touch of sweet light malts up front on the tip of the tongue but that only lasts for a split second. It is immediately followed by a citrus sharpness; a tingling on the tongue. (Similar to an IPA sharpness on the tongue but without the bitterness) That is followed by cleansing effervescence over the tongue throughout the middle of the sip. The back-end is extremely easy drinking with an effortless swallow. The finish is very refreshing with a light malt sweetness and sharp tastes of lime citrus and spicy notes. The finish is also very dry for a light ale but there is little to no hop bitterness. The dryness seems to be coming from the citrus. The final aftertaste is a lingering citrus flavor (more lime than lemon) along with a very interesting spicy note. The spice seems to also add to the dryness of the beer. I’m really not sure how much I like this but it is a very refreshing beer. There is the most unique tingle on my tongue. It’s like a very hoppy IPA but there is no hop bitterness. The bitterness seems to be all from the citrus (lime). I just poured a second one to help me decide if I like this or not. It’s really is not bad, I just don’t know what it’s trying to be. Or am I trying to force it into being something it’s not. I think if this was marketed as a Lime Shandy I would have a different opinion of it. Wow, is that the beer snob in me or what. I just looked back at the description and noticed that this is brewed with Ginger. That’s the bitterness that I couldn’t understand earlier. So I finally got it; Sarsaparilla Ginger Lime-Aid Ale. That is what this taste like. It is a pretty refreshing beer it’s just not all that enjoyable for me. I’m going for a C+. It is a very refreshing lime citrus ale with a dry spicy note finish. This will be a great summer ale for those really hot days at the beach.